KUWAIT: Sarah Abushaar delivers her speech. KUWAIT: The Arab Woman Awards took places recently in Kuwait, during which several stateswomen were awarded for their contributions in business, education, art, humanitarian action and various other fields. Sarah Abushaar delivered a speech during the event, in which she underlined the important role that women have played in human history. “History and humanity are rich in the stories of leading women who transformed their worlds — indeed our world at large — and pioneered a path for the generations. But their monumental gains were not without monumental challenge,” she said. According to Sarah, Kuwait is no stranger to the pivotal role of women in our society. 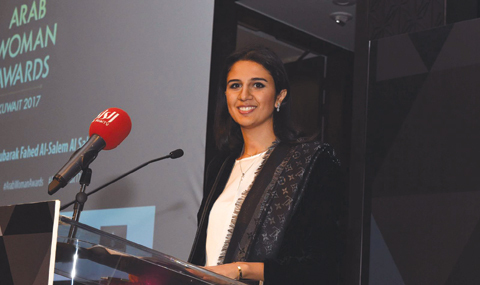 “[Kuwait] is historically home to some of the most active and progressive women in our region and some of the biggest bright spots of female attainment,” she said.